This is a simple weekday supper that is quick to make when you’ve come home hungry but don’t want to skimp on a fresh but filling supper. The dressing I used for this is a take on the Vietnamese dipping sauce, Nuoc Cham, which as it has a wonderful interplay of sweet, sour, salty and spicy. It works as well with light and crispy spring rolls or prawns as it does in meatier dishes like this. Crispy lettuce or bag of crunchy salad mix (I also had some baby corn in the fridge, so I used that. You could also add green beans or mange tout). Torn up mint leaves, to serve. 1. Flash fry the sliced beef in sesame oil, for no more than 2 minutes on each side, less if the steaks aren’t particularly thick. You just want them to get a good bit of colour, but still be nicely pink in the middle. If you have a grill pan, use that. Put the steaks to one side to rest for a few minutes before slicing. Meanwhile, get cracking with the sesame seeds and dressing. 2. Toast sesame seeds in a hot pan- keep an eye on them as they’ll burn in seconds. 3. To make the dressing combine lime juice, chopped chili, fish sauce and mirin (or sugar). 4. Combine the your salad leaves with the sliced carrot and cucumber and top with the beef. 5. 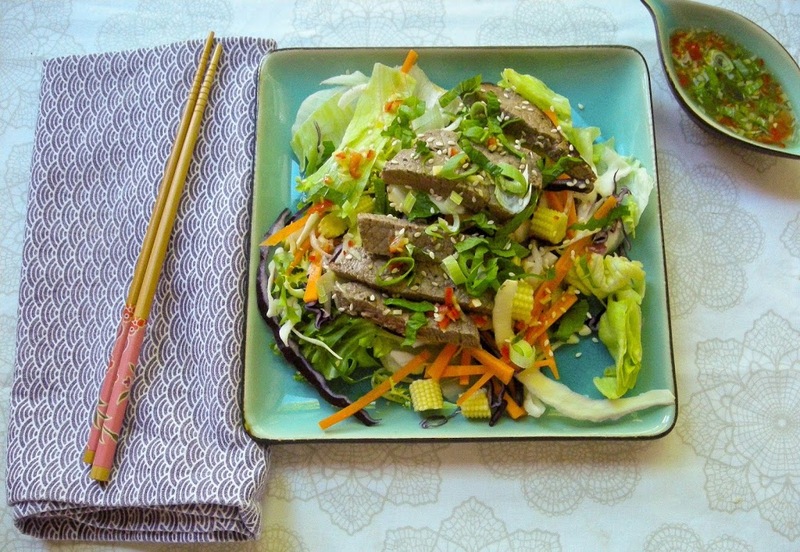 Serve drizzled with the dressing, a sprinkling of sesame seeds, spring onions and mint.